Hooray for Comics: Welcome Back Cotter! It has been OVER A YEAR since I've written a blog post which is extremely embarrassing but I have to let you know, dear readers, that I have used that time well! 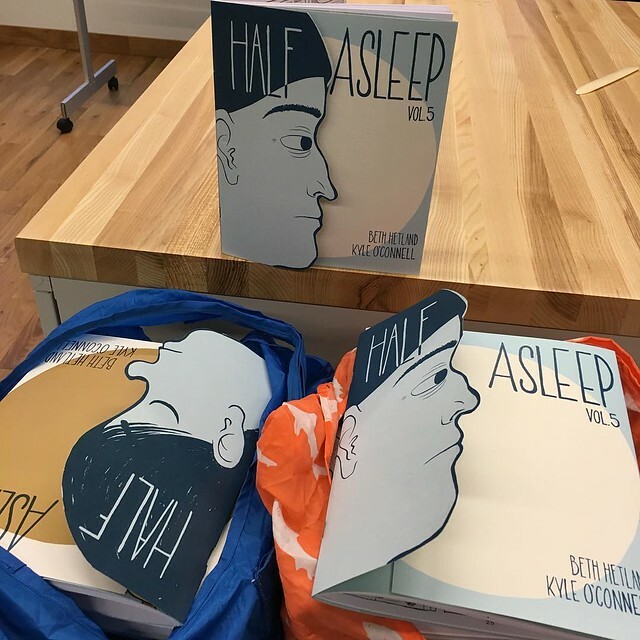 I've been working hard on Half Asleep (for sale at my store). There are now FIVE volumes that are completed, four are available for sale online and volume 5 will be available for the first time at Emerald City Comic Con which runs from April 7th until April 10th, I'll be there the 9th and 10th tabling with the one and only Colleen Frakes!!! !I'm really excited about trying to get back into the habit of blogging again. Something I want to try to do is to post more process work and try to get at least once a month if not more! I'd also like to try a "Ask Me!" section to see if there are any questions people have that they'd like to know more about. SOOOOO if you have any burning questions about comics, my process, teaching, or anything else feel free to leave it in the comments.